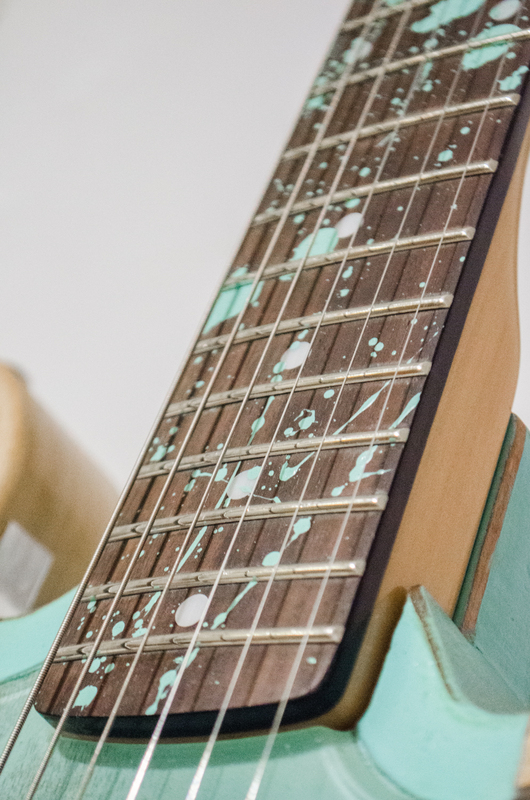 We are more than happy to connect with pickup manufacturers and install them in our instruments. Just tell us what you'd like and we'll make our best to get them for you. If you have a different model for the bridge and the neck, please specify. Please copy and paste a link to the website or a picture of the pickups you'd like. Body Composition - Mahogany tone-wood and polymer variation. Neck Composition - Bolt-on maple neck with rosewood fret-board. Neck Specifications - 21 frets, 12” radius, standard 2 3/16” wide neck heel. Controls - Tone and Volume knobs with a 3-way selector switch. Sound Reactive RGB LED System - ON/OFF Push-Button, 3.7v/ 2200 mAh Lithium Rechargable Battery, 5v output jack and charger. Please don't leave any field blank, if you do we'll have to assume that you are selecting the default. What color would you like the border to be? You can leave the wood exposed as well. Please list between 2 - 5 colors in order of preference and dominance over the design. Please copy and paste a link to the manufacturer's website or a picture of the pickups you'd like.